Also, contrary to a lot of people, we like to take a little bit of time at the end of a game before starting a sequel, so we can wait for the excitement or disappointment and everything else of the experience to shake down and really see what we should do in the next game. 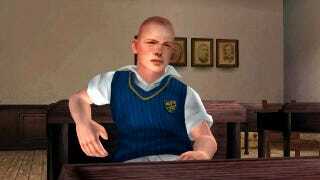 So we knew that we didn't want to start doing the Bully sequel instantly at that second with those guys — even though it is a property that, like Max, we adore and might come back to in the future. There was just no impetus to do that then. So we said, "You can do Max, and then we will see what we can do with Bully." So it was really waiting for the slot to open up and the group to open up to at least start work on it. So, at the very least, Houser and the Rockstar crew seem to know that players want a return to Bulworth Academy. This is good news. Other tidbits from the interview indicate that there will be DLC for Max Payne 3 and it'll be at least as frequent as what was delivered for Red Dead Redemption. It's a rare thing when either Houser brother gives an interview and there's more fascinating stuff to be learned in the whole piece. Go over to Gamasutra to read the whole thing.